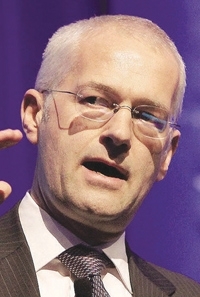 VW's Jonathan Browning: The goal isn't only about volume. It's also about profitable, sustainable growth. Volkswagen aims to be the best-selling global automaker by 2018 and a central part of its plan to get there is the goal of boosting core-brand sales in the United States. By 2018, the brand aims to sell 800,000 vehicles a year in the U.S. market, a level never attained in VW's 57 years of selling vehicles in the country. The brand sold 324,402 units in the United States last year. The goal, set in 2008, is an important element in VW Group's bid to overtake General Motors and Toyota to become the biggest global automaker by 2018. But what, exactly, will it take to get there? VW Group of America CEO Jonathan Browning and other executives have talked in general terms about improvements needed for VW's product lineup, vehicle quality, North American manufacturing capacity and dealerships. Today VW's North American production and dealer network are sized for much smaller volumes. The brand hasn't sold more than 500,000 vehicles a year since 1971. VW dominates in other regions of the world where it sells cars, but in the United States it was only the No. 10 seller this year through July. Browning has stressed that the goal isn't only about volume; it's also about profitable, sustainable growth. VW also wants to lead the industry in quality, customer service and many areas. But the company will need a major makeover of U.S. operations to transform the brand into one that's fit to rival the top sellers Ford, Chevrolet, Toyota, Honda and Nissan. Assemble more of its U.S.-sold vehicles in North America than it does now. As a move in that direction, VW opened a $1 billion plant in Chattanooga, Tennessee, last year and has enough land to build a second, mirror-image facility on the other half of the site. Audi's decision in April not to build its new factory there is telling; that empty land could be reserved for VW. Add a third-row SUV and develop more cars tailored to U.S. buyers. Already, three models have had U.S. makeovers: the U.S.-built Passat and two models built in Mexico, the Jetta and Beetle. Other models could follow. Increase per-store sales and add stores, especially in the central states where VW isn't heavily represented. VW has about 600 dealerships nationwide, far fewer than larger competitors have. Improve quality and reliability scores. The brand, while getting high marks on looks and appeal, has long sagged in these areas. VW has stepped up efforts to tackle its quality problems, but progress has been slow. In June, its ranking in the J.D. Power and Associates Initial Quality Study slipped a notch, to a tie for No. 29 out of 34. The VW brand has made major strides toward its sales goal. It posted double-digit U.S. gains in 2010 and 2011, thanks in large part to the success of the redesigned Passat and Jetta. Through July this year, VW brand's U.S. sales have climbed 34 percent to 245,739 vehicles. "There is certainly some confidence there," said Jeff Schuster, senior vice president of forecasting firm LMC Automotive in suburban Detroit. "There is an early indication that what they're doing is working." But he added: "There is a lot in between this initial success and the target" in 2018. "Their competitors are aware of it, and they have their targets, too," Schuster said. VW's product lineup remains a major hurdle. The portfolio needs more competitive offerings in two crucial U.S. segments, crossovers and SUVs. And unlike other big-volume sellers, such as Toyota, Nissan, Ford and Chevrolet, VW doesn't sell a full-sized pickup or sedan in the United States. "VW doesn't have the breadth of product right now to hit 800,000, and they haven't provided a road map of how they're going to get there," said Dave Sullivan, an Ann Arbor, Michigan, analyst with research company AutoPacific Inc.
VW's premium pricing also limits U.S. sales. The company builds about 30 percent of its U.S.-sold vehicles in Europe. With import costs and the euro's strength against the dollar, that makes it difficult for VW to compete aggressively on price. It also creates inconsistencies in VW's lineup. For instance, the Golf, a compact hatchback built in Germany, starts at $18,765, including shipping, about $1,350 higher than VW's comparably-sized Jetta sedan, which is built in Mexico. The Jetta and the redesigned Passat, which is built in the United States, have sold well, but other vehicles in the VW lineup are priced more like VW's luxury sibling, Audi, than like the brand's mainstream competitors. "They need to address the pricing issues, and that's going to be difficult when the [nameplates] they haven't addressed are coming from Europe," said AutoPacific's Sullivan. VW executives admit the U.S. portfolio is a work in progress. Rainer Michel, VW of America's vice president for product strategy, told Automotive News, a sister publication of Automotive News Europe, last month that the Tiguan, a model that competes in what has been a fast-growing market for compact SUVs, will play a much more important role in the future. Introducing an Americanized version of the Tiguan is a top priority, Michel said. Right now, the Germany-built Tiguan, which starts at $23,660, including shipping, is slightly more expensive than its chief competitors, the Honda CR-V ($23,325, including shipping) and Toyota RAV4 ($23,460, including shipping), and offers less legroom and cargo room. VW sees room for a small SUV below the Tiguan that would be built locally and tailored to the United States, Michel said. Also important to VW's U.S. target is a third-row SUV to compete with models such as the Ford Explorer and Honda Pilot, which dominate the popular mid-sized SUV market. This is a model Browning has called for repeatedly. "We have quite a lot of nameplates in the market today for our total volume," Browning said. "But we don't have enough depth in key segments." Aside from the Jetta, few other VW models have broken through the 50,000-a-year-mark in sales. To change that, Browning said VW is paying closer attention to U.S. buyers' wants and needs and is designing vehicles to better suit them. For instance, when VW realized U.S. drivers use air conditioning differently from Europeans, it changed the faceplate so the controls are easier to read and visible at all times, Browning said. The company also changed the seat adjusters to better conform to American expectations. The company is counting on a new highly flexible platform debuting this year, the MQB, to help produce more U.S.-targeted vehicles. The platform will allow VW to develop cars faster and cheaper, making them easier to tweak for specific regions. More built in the U.S. The capacity to build cars in North America will be crucial. By 2018, VW aims to assemble at least 70 percent of its U.S.-sold cars in North America -- about 560,000 vehicles a year -- a goal that will require it to expand manufacturing operations drastically, especially in Chattanooga. VW's plant in Puebla, Mexico, where it builds the Jetta and Beetle, has reached full capacity, VW officials say. Puebla produced 510,104 vehicles in 2011. About 40 percent of the vehicles made annually in Puebla go to the United States. In Chattanooga, VW in July added 800 hourly workers, longer shifts and Saturday production so the plant is running two 10-hour shifts six days a week, instead of two eight-hour shifts five days a week. The change will enable the plant to increase its annual capacity to 180,000 in the second half of 2013. VW can further boost capacity to 250,000 vehicles a year there by increasing line speed and throughput in the paint and body shops, Browning said, although it hasn't made any decisions on that yet. But the existing factory occupies only half the site's land; there's still enough room for a mirror-image plant. So VW could build as many as 500,000 vehicles a year there, Browning said. "If Chattanooga were expanded to the numbers we're talking about, you wouldn't do that with a single product," Browning told reporters in May. "We'd be adding a second line." As VW approaches its sales target, look for it to consider another assembly plant, said Ron Harbour, an analyst at consulting firm Oliver Wyman. "I guarantee they have plans for that," he said. "It's just a matter of when they push the button." Other manufacturing operations could follow, such as a stamping or transmission plant, industry experts say. Already, VW has committed to opening an engine factory in Silao, Mexico, next year capable of building 300,000 engines a year. "They're still relying heavily on engines and transmissions from Europe," Sullivan said. "They need to break free from that. But it's a chicken or the egg. Do you put the plant here and assume you get the volume or the other way around?" VW also must fix its quality problem. Quality and reliability usually trail only price as criteria consumers use to choose a vehicle. VW has performed poorly for years in industry reviews, such as J.D. Power's quality and dependability surveys and testing by Consumer Reports. The brand never has ranked above the industry average on J.D. Power's Initial Quality Study, said Dave Sargent, J.D. Power's automotive vice president. On Consumer Reports' 2012 report card, which measures reliability and on-road performance, VW ranked No. 9 out of 13 major automakers. If VW is to hit its sales goal, said David Champion, director of automobile testing for Consumer Reports, "They've got to be in the top five." The brand's reputation has suffered repeated dings on a range of issues: major engine and transmission problems, along with less catastrophic issues such as oil leaks, electrical glitches, power window malfunctions and interior trim falling off, Champion said. What's more, most major problems typically start at the four- to six-year mark, after the vehicle has come off warranty coverage, Champion said. That's also about the time people start thinking about buying another car. Brand executives know they need to make some big gains in this area, and quickly. Last year VW began sending surveys to all buyers of new VWs to get feedback, Marc Trahan, VW of America's quality chief, told Automotive News. The survey questions, which are sent out two to six weeks after the purchase, are based on questions included in Power's Initial Quality Study, said Trahan, who was recruited from Audi in 2011 to take charge of VW's quality problem. "We get data on a monthly basis that we channel back to the factory," he said. VW also has stepped up collaboration with J.D. Power, involving the research group further upstream in product development, which has helped VW reduce defects on the factory floor, Trahan said. As a result, VW and its dealers say warranty-repair hours are down. Trahan said the goal is to be in J.D. Power's top five for IQS. While quality remains a nagging problem, VW has done well in other areas, such as J.D. Power's Automotive Performance, Execution and Layout (APEAL) Study, which polls consumers on looks, driving performance and appeal. Last year, VW ranked highest of any nonpremium brand. J.D. Power's Sargent says VW needs to strike a balance, improving quality and appeal to U.S. buyers while retaining its German character. Said Sargent: "They don't want to be a Japanese or domestic with a VW badge."